Appetite for cross-channel purchasing has increased by 19% since 2014 with 56% of smartphone owners now having researched products on their mobile with the intent of purchasing later in-store. However, a whopping 70% of retailers do not offer a store stock check from their websites. The 30% that do are way ahead of the curve and will be favoured by the mobile consumer, shopping on the go. Three retailers are particularly innovative within their sector for providing a stock check, or reserve system on their product detail pages. F.Hinds is one of the first retailers in the UK jewellery industry to implement an in-store stock check online. 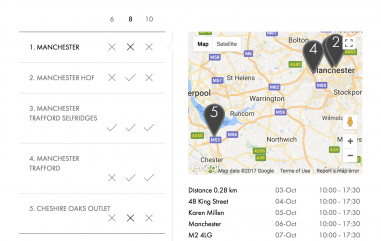 The tool utilised geolocation, checking stock across the entire store estate and allows customers to reserve items to view them in-store. Stock can be transferred from store to store, if necessary. Another layer of logic, specifically for rings, alerts a customer if a ring is available at their local store in a different size, allowing a customer to reserve it anyway in order to see it in person.Reserve and collect is favoured over click and collect so that a customer can view the items before making an expensive purchase. Details such as these show that F.Hinds ecommerce team know the market and are willing to invest in technology that focuses the reserve and collect offering on what customers actually want. Especially on mobile, a focus of many retailers is to drive footfall to stores. Schuh, for example, offers customers nearly immediate fulfilment. On both mobile and desktop, the website is fast and slick. 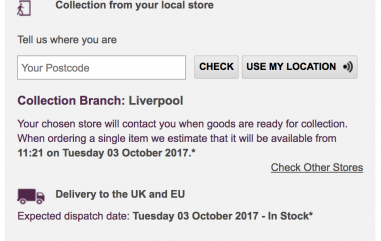 Even though the stock check doesn’t use automatic geolocation, it is still easy to use by entering a postcode or choosing a town. 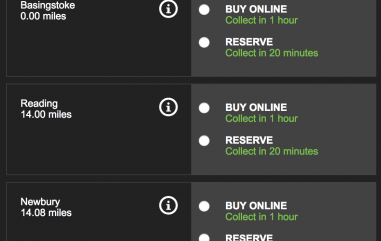 The checker offers both reserve and collect and buy online and collect options, with reserved items taking just 20 minutes to become available. According to Think with Google, showing in-store stock levels drives 3 out of 4 shoppers to store. Centralising stock data isn’t easy or cheap, but the reward for doing it sooner than later is great and lasting. Retailers who already have a single view of stock and have invested in offering a good stock check in-store from both mobile and desktop ecommerce websites will certainly have an advantage over those that have not.